So anyone that knows me, knows I have a cookbook addiction, I have so many, but I continue to buy more. Well this recipe comes from a new cookbook I bought recently, and these Fish Tacos are delicious, they are beyond delicious, they are amazing. They have spice, they have crunch, they look so pretty, they are a flavour bomb, seriously they are so good. My kids could not stop eating them, they were truly excited by these tacos. This is my first attempt at a fish taco, I see them all over the place but I never got around to making them. 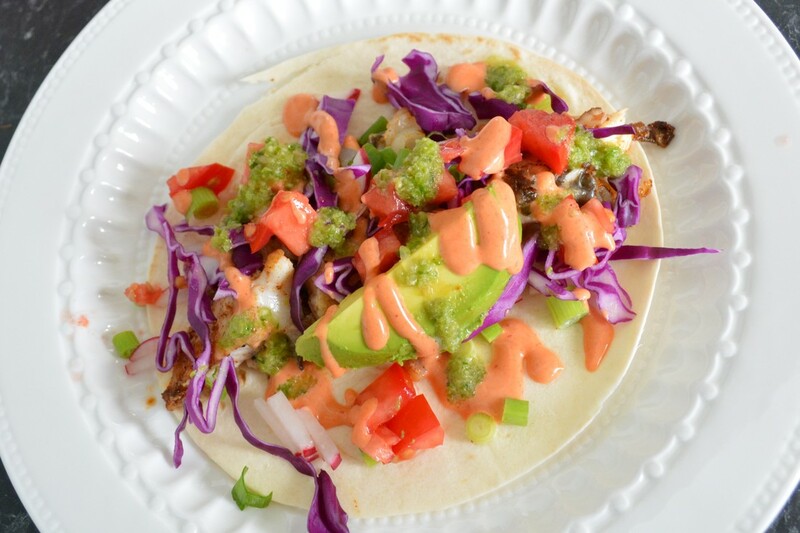 They are delicious, I'm seriously not going to try another fish taco recipe, ever, as this one is perfect. ​With the hot green pepper sauce, I used 4 long green chillies, leave the seeds in. Now I like it spicy, but not where I can't taste anything. So when making this sauce, make it to a level where you will enjoy it. This is why I will never stop buying cookbooks, as it allows you to find recipes like this. This is a recipe you need to try, it's so good. Make the hot green pepper sauce: In a small food processor, add the chillies, garlic and 60ml water and pulse about 15 times to get everything chopped, then blitz until almost smooth, a few bits and seeds are ok. Transfer to a bowl and add the brown sugar, fish sauce, lime zest and juice. Cover and set aside until needed. Refrigerate if making in advance. Sriracha Mayonnaise: In a bowl, stir together the mayonnaise and sriracha, until combined, set aside until needed. Refrigerate if making it in advance. For the fish: Take the fish out of the refrigerator at least 30 minutes before frying. I like to place each piece flat on a large plate so they lose their chill quicker and aren't cold when cooking. In a bowl, combine the chilli powder, garlic, salt, pepper and 1 1/2 tablespoons of the oil. Rub the spice mixture all over the fish. Heat a frying pan over medium, high heat. Add the remaining 1 1/2 tablespoons of oil and when the pan is hot, add the fish in one layer and cook until slightly charred, about 2 minutes on each side for John Dory. Remove from the heat, cool slightly, and flake the fish. Assemble the taco: Warm the corn tortillas, two by two, in a dry pan set over medium heat, flipping after a few seconds. Stack the hot tortillas to keep them warm. Flour tortillas I wrap in aluminium foil and place in a 180C oven for 5 minutes to warm up. 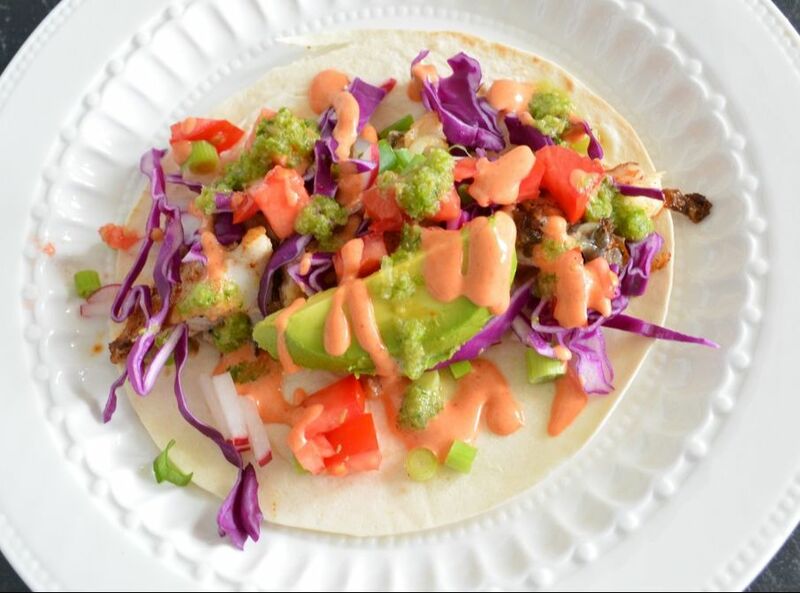 Spread 1 tablespoon of the spicy mayo on each tortilla, then top with some fish. Top each taco with some cabbage, tomato, radish and shallot. Then top with acocado. Drizzle with the hot green chilli sauce. Granish with coriander and serve with lime wedges.